Yes, it does like a ZX-81 (as pointed out by Neil Ford)! My new iPad mini was bought with the knowledge that it would be used for work as well as pleasure, so I bought myself a Belkin keyboard case as well as a Smart Cover. The keyboard case looks very good - the effect is of an old style paper organiser (if you remember those by 'Time Manager' then you'll have a good analogy but it is much thinner). It should give moderate impact protection. There is a micro-USB port for power, plus an on/off switch, a pairing button for bluetooth, and an LED to indicate charge status. Pairing is no different to any other bluetooth keyboard under iOS and I had no difficulties. The keyboard is tailored for iOS: there is a Fn function key to allow keyboard access to search, show/hide keyboard, cut/copy/paste, music and volume and screen lock. The home key is also dedicated on the keyboard. The keyboard is made of plastic, but quite solid. The build is better than the Zaggmate keyboard cover for my older iPad 1 (which had a habit of loosing keys) but noticeably less solid than Zagg's keyboard folio for the better half's iPad 2, probably as that has an aluminium chassis. 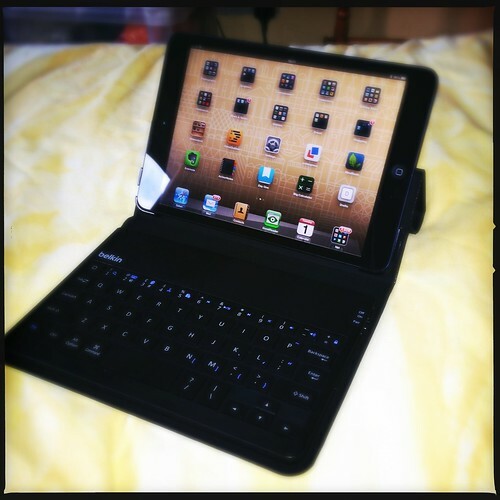 The Logitech Tablet keyboard (which is close to full size), feels more solid but is far larger. The keyboard pitch is tight and needs some getting used to, altogether understandable due the size of a 7.9" tablet like the mini. While typing this, I've repeatedly pressed "/" due to the truncated nature of the spacebar which it is adjacent too. I also find the backspace to be out of position, and keep on hitting the "=" button instead. However, both of these are noticeably becoming less of an issue as I get more familiar with the keyboard layout and action. However, there is one design flaw, related to apostrophes. These are positioned where you'd expect them (near the enter key) but they both need to be accessed with the Fn button rather than a clean press for the single apostrophe, and a shifted press for the double quotes. This is the biggest let down about the whole device, and I've not yet convinced myself that I will get used to it. It suggests that although the keyboard case was 'designed in California' it was designed by someone that rarely does any extended typing. I would rather have the semi-colon and colon key operated by the function key and have the apostrophes directly accessible. Overall, I do like the keyboard, but how well that I adjust to the apostrophe design decision will determine if I ever love it. Updated 13/1 to reinstate missing key names.